I’m back! I hope you all have been enjoying the holiday season so far. I had a wonderful Christmas with my family in Monterrey, Mexico. It was a bit of an unexpected trip so the last couple of days I was rushing around to get everything ready but I’m so glad I went. I got to see a lot of my family, we played Loteria, ate a lot of tamales and just enjoyed being together. I’ve also been quite spoiled this holiday. For example, just look at the loot I got from my Secret Santa. A pretty bookmark with calendar, a bookmark notebook, chocolate and gorgeous handmade paper, which you know I will most definitely use. 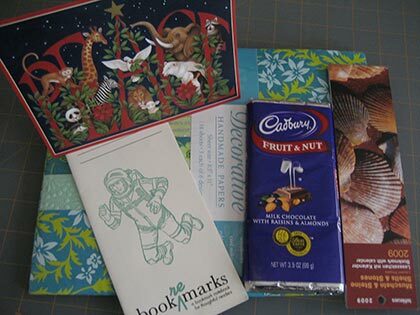 I feel bad though because I’m not sure who my Secret Santa is – Kim, I don’t have your blog address but if you are reading this, many, many thanks! And, then my dear husband totally surprised me with this book bounty. He went back through my posts and found one where I gush about wanting these books. Isn’t he great? Now my artsy/crafty library is even more complete, and I have a button to wear to proclaim my book madness. Heh. Anyway, thank you to everyone who stopped by and left Christmas wishes. I am looking forward to doing some serious blog hopping. Welcome back, Iliana! 🙂 I’m glad you enjoyed your holidays with your family in Mexico. Welcome back! Glad you had a nice time away. And wow, your Secret Santa and your husband were very good to you! Welcome back, Iliana! I’m glad you had such a great time. And your hubby did an impressive job! Wow! I’m glad you had such a wonderful holiday! Happy New Year too!! Yay, a new Persephone! 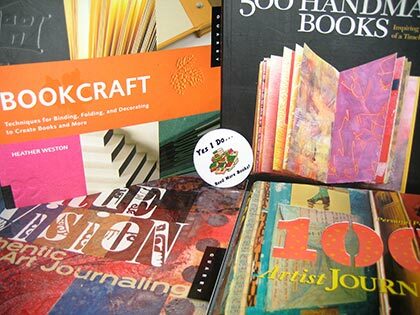 And what a nice husband to surprise you with so many great crafty books. They look like they’re full of great ideas! Glad you had a nice holiday. And I received one of your journals for Christmas from Serena. (I blogged about it in my latest Mailbox Monday post.) Just wanted to tell you I think it’s gorgeous! Thanks! Melody – Thanks! I already opened up the paper pack and have been petting the pretty papers. My mom is in town though so not a lot of bookbinding is getting done but hopefully next week things will get a bit more settled. Hope you had a great holiday too! iselldreams – Thank you! happy New year to you too! It’s good to know there are some men who pay attention! Good for your hubby! Hope you have a great new year. What fabulos presents you got! I’m glad you had such a nice Christmas 🙂 And you got some lovely gifts from your Secret Santa and your husband! I’m glad you had a nice trip to Mexico, and enjoy those new books! It sounds like you had a great trip, Iliana, and a wonderful Christmas! Enjoy your new treasures! Jodie – Hope you are enjoying the holidays too! Welcome Back! What a clever husband you have!! My hat is off to him. I’m glad you liked the presents, it was a fun swap. 😀 Happy New Year! Mmmm … fruit and nut bars – yummy! Sounds like you had a very merry Christmas. And how sweet of hubby to do that for you! I am still catching up on blogs after the holidays. LOL I am so glad that you had a great holiday. Looks like you got some great gifts. I can’t wait to see what journals you make this time.